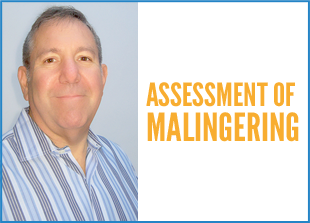 CONCEPT Professional Training, a global leader in online professional training in forensic mental health, announced today that it has launched a new professional online training program on Assessment of Malingering, developed by Dr. Barry Rosenfeld. This training program reviews the tests and techniques currently available for assessing malingering of cognitive impairment and psychiatric disturbance. Among the tests reviewed in this workshop are the measures such as the Test of Memory Malingering (TOMM), Validity Indicator Profile (VIP), MMPI-2, Structured Interview of Reported Symptoms (SIRS) and the Miller Forensic Assessment of Symptoms Test (M-FAST. This training program is relevant for professionals who want to obtain or strengthen skills in forensic evaluation, including those involved in civil and criminal forensic mental health assessment, forensic inpatient and community settings, and those who work at the intersection of clinical psychology and law. For more information on Assessment of Malingering, visit here.